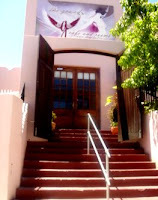 It was early evening and Eugene and I were visiting the first born of the Grand sisters, The Grand Café & Rooms at 27 Main Road, Plettenberg Bay. We entered the Café through huge double doors and the same feeling of otherworldliness that we experience at Grand, Camps Bay and Grand, Granger Bay overtook us. We were encountering another era, another time and place. Lights are dim and the lamps are lit. But it is far from gloomy. It is warm, welcoming and bewitching. Plettenberg Bay was enjoying a balmy evening and we were shown to a table on the terrace. This meant passing through the interior of the restaurant and past the fantastical things that are everywhere. The terrace is cool and sheltered with a view of sea and white sands and pale blue mountains in the distance. The menu is compact and interesting with a vague retro feel about it, which is a Grand signature. 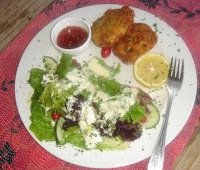 One can enjoy a number of simple, well-cooked dishes, including excellent salads and the line fish of the day. Meat eaters can be tempted by Fillet Bearnaise & Chips or a Durban Lamb Curry served with Basmati, sambals and Papadums. After eager deliberation and knowledgeable advice from our excellent waiter Mponde, I chose the famous 'Grand Fish Cakes' and Eugene opted for the 'Mussels and chips.' The Grand has a very good house wine and we ordered a bottle of the white. We had chosen our food well. The fish cakes were indeed 'grand'. They were served with a crisp salad and a sweet chilli sauce. The bowl of mussels, was delicious, creamy and garlicky. We lingered over our food and wine and people-watched. This Grand attracts beautiful people in the same way as her younger sisters do. Incidentally, pets are welcome, but not children under 16, except occasionally for lunch or breakfast. 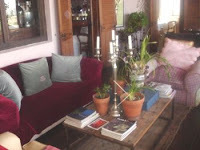 On the terrace there is a great big red velvet comfy sofa with two easy chairs and a coffee table with books, plants and a silver chandelier. People stop there to relax and enjoy pre-prandial drinks and mellow into an already mellow atmosphere. You can also enjoy a delicious breakfast at the Grand. From 7.30am you can order a healthy breakfast of muesli, yoghurt and honey, washed down with a fruit smoothie or the health juice of the day. Perhaps a Grand stack of pancakes layered with bananas and maple syrup or French Toast with bacon and maple syrup will appeal to you. Then there is the Petit or the Grand breakfast. Delicious creamy scrambled eggs, crunchy bacon, caramelised tomatoes and more. It is all very yummy. Breakfast is served until 10am. I could hardly wait to prowl around and explore a little. The decor is marvellously tongue-in-cheek. Everything is everywhere. In the small sitting room there is a leopard skin complete with a snarling head atop a red velvet two-seater sofa. Behind the beast is a bookcase crammed with books and memorabilia and above, a quirky chandelier. There is a patio off the room that leads to a dip pool with four stone maidens kneeling beside it. 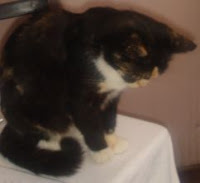 ( I was actually trespassing into an exclusive area for the guests of the hotel, but more about the hotel later) And that is where I met Tabitha the Grand cat. All cats are special and Tabitha is especially special. I believe that cats are good spirits in a home and the Grand has a feeling of being filled with many good spirits. As it grew dark outside, candles were lit and the silver candelabra and silver domes shone in the lamplight. There are wonderful touches in the main dining room. Long, sparkling white linen table cloths sweep the floor and the café-style chairs are covered in red velvet. Vases are stuffed with red roses, a very Grand thing, and cushions, plump and comfortable. There is a beautiful oval mirror sporting the following scrap of wisdom from Socrates, 'Bad men live that they may eat and drink, Good men eat that they may live.' 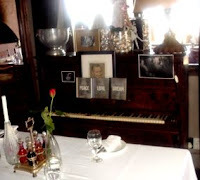 There is a piano, a basic Grand requisite, with the words Peace, Love and Dream on the music stand. At the end of the room is a great wooden dresser- type bar behind which chef Lunge, works his magic. When Suzette Main acquired this property from the previous owners, she wisely and happily kept the chef and many of the staff. 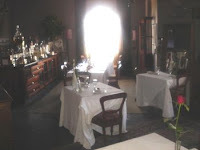 The restaurant is only one part of Grand Café & Rooms. The 'Rooms' part of the moniker refers to the 8 amazing rooms where one can stay and hedonise to the limit of one's senses. I was shown the rooms and immediately fell in love. Each room has its own entrance. Inside, a huge double bed, so high that you need an antique velvet step to climb up onto the delights of snow-white percale linen and big puffy goose down pillows. Wonderful pieces of furniture and objects everywhere and vases of red roses and candelabra that are reflected in big oval mirrors. Most amazing of all, in one room, a great Victorian bathtub standing saucily in the bedroom next to a window. Imagine luxuriating in a perfumed bubble bath, sipping champagne from a crystal flute and gazing at a breathtaking vista of mountains and sea. We were not permitted to photograph the bedrooms, so you will just have to go and see for yourselves. The Grand is open for dinner from Monday to Sunday. The Grand is open for breakfast and lunch Monday to Sunday in December and from Tuesday to Sunday the rest of the year. It is essential to book, especially at night. The rule of no children under 16 years old applies also to the hotel. Eugene and I love eating out and we always pay for our meals. Oh wouldn't it be grand to revel in such a bathtub! Your beautiful description evokes a truly tantalizing vision!